Battery Lifting Beams from BHS provide sturdy, durable points of contact between forklift batteries and Gantry Crane systems. For batteries that have four integrated attachment points, the Battery Lifting Beam-Four Point offers greater stability and control during the change-out process. This Gantry Crane attachment provides safe and durable control over forklift batteries in vertical-extraction applications. The hardwood core of the beam provides reliable, non-conductive support for batteries that weigh up to 6,000 pounds. 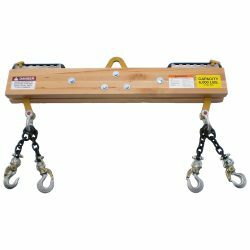 Each pair of attachment hooks hangs from heavy-duty chains that lead to an adjustable steel anchor to accommodate batteries of various sizes. Fleets that use a single uniform battery size can opt for fixed hooks on each end, and the full range of BHS hook configurations is available for every order. Optional grab handles provide even greater control for staff members during battery removal and installation. Multi-point lifting with a Battery Lifting Beam-Four Point improves safety and efficiency when batteries must be removed or installed in lift trucks. All Forklift Battery Handling Beams are constructed out of hardwood and heavy-duty, powder-coated steel in the BHS factory in St. Louis, Missouri. If you have unique needs, our engineers can alter or design a Battery Handling Beam to match your application. Download the product details from the above link. To learn more about equipment for battery handling equipment in vertical-extraction fleets, or to find a dealer near you, call our sales team at 1.800.BHS.9500.